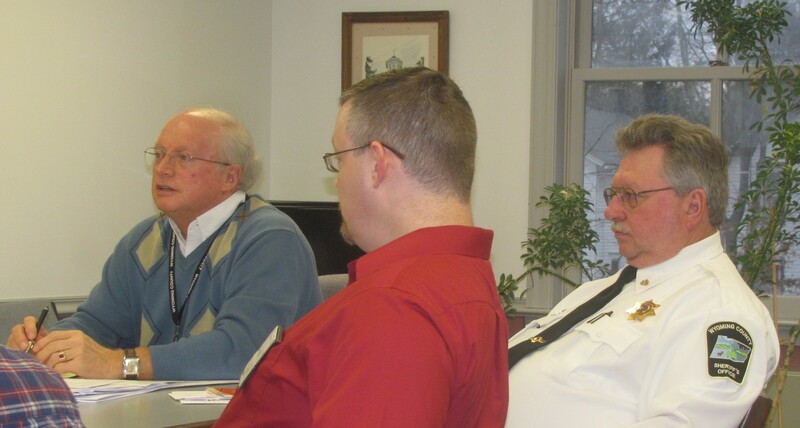 Wyoming County Prison Board members, including (from left) Chief Clerk Bill Gaylord, Warden Ken Repsher, and Sheriff Ed Sherman met at the courthouse in Tunkhannock on Jan. 14. Wyoming County Commissioner and Prison Board member Tom Henry announced on Jan. 14 that the specs are in for a new water heater system to be installed at the Wyoming County Prison and will be put out to bid next week. It was noted by Warden Ken Repsher at last month’s meeting that the current boilers were showing signs of fatigue, and that it was becoming increasingly difficult to meet the need for heat and hot water at the facility since winter had set in. The current heating system has been in operation at the prison since 1986. Bids, which will be advertised in local papers this coming week, will be received through 4 pm on Wednesday, Feb. 5 and will be opened on Feb. 6. Repsher noted that several fire alarms at the jail will be moved as per recommendations listed in a recent inspection. The initial placement of some of the units made it difficult for the inspectors to get to them, he explained. As of Jan. 14, there were 53 men at the correctional facility and 12 women. New commitments and releases evened out at 31 each, so there was no monthly change in population. There is currently one Susquehanna County prisoner boarded at the facility in Tunkhannock and one Wyoming County inmate held in Lackawanna County. Judge Russell Shurtleff related that the local prisoner was sent to the Lackawanna County Correctional Facility due to a disciplinary issue and not because of overcrowding. December marked the first month in over a year that the county has not paid to board out prisoners to adjacent facilities. The overcrowding peaked in May 2013, when the Wyoming County Prison was billed $24,285 for inmates housed elsewhere. Drug and alcohol counselors made 19 visits to the prison last month for 203 meetings, some prisoners being visited more than once. There were 16 visits from religious organizations, and mental health counselors made seven visits to inmates.